9:00 PM Tour ends - Drop at respective pick-up points. Please Note: Telangana Tourism Nizam Palace Tour Start time is 1:00 pm from begumpet, however the bus will reach Falaknuma Palace at 4:00 pm after covering other places, that are part of the tour. Located at a distance of 5 km from Charminar, at engine Bowli in Falaknuma, Falaknuma Palace Hyderabad stands majestically on a 2000-foot-high hill. This palace is sure to take you back to Nizam Era, to its glamour and luxurious living. 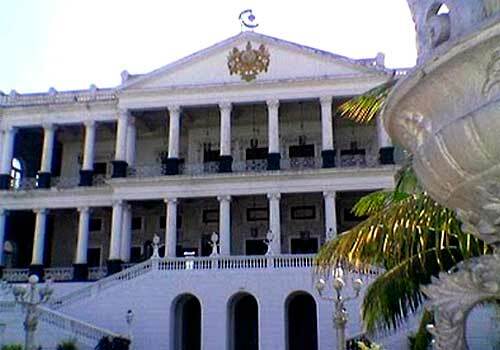 Falaknuma Palace was built by Nawab Vikar-ul-Umra. With the construction laid out in 1884, it took almost 9 years to complete the construction of the palace. One of the popular tourist spots of Hyderabad, Taj Falaknuma Palace was later purchased by Nizam VI in 1897. The palace served as a royal guest house to him. Constructed over an area of 32 acres and approximately 2,000 feet above Hyderabad, the Falaknuma Palace has been constructed with Italian marble. Built by an Italian architect, the palace is one of the architectural wonders of 19th century and is often referred as "mirror of the sky". With interiors decorated lavishly, the palace has close to 220 rooms and 22 halls, each designed beautifully. One of the most captivating features of this palace is its innumerable Venetian chandeliers; their exquisite beauty and large size alluring every visitor. 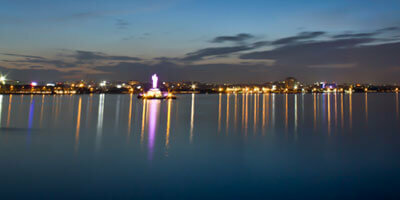 The palace represents the glamour of Nizam era and its carefully designed architectural beauty. It is said that Nizam was an ardent traveller who used to love collecting souvenirs from places around the world. This is one of reasons why Falaknuma Palace houses such a rich collection. Not only chandeliers Taj Falaknuma Palace boasts of marble staircase, carved balustrades, huge library and unique collection of the Holy Quran. Along with this, the rosewood dining table of the palace with a capacity of hosting 100 guests at a time is also worth noticing. The Nizam also treasured massive collections of rare paintings, statues, furniture, manuscripts and books. The Jade collection of the Falaknuma Palace is famous all over the world. Gardens, Mughal, Japanese and Rajasthani here at the palace are also exceptional. Although Taj Falaknuma Palace is one of the most important places to visit in Hyderabad, it is not open for general public. If interested in visiting you can book a day tour, Nizam Palaces Tour by Telangana Tourism. 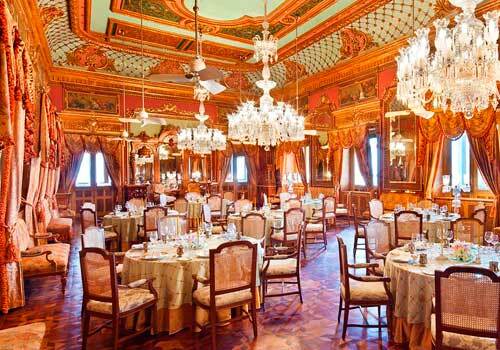 Visitors are taken to Falaknuma for tea in evening where they can also see this captivating palace. 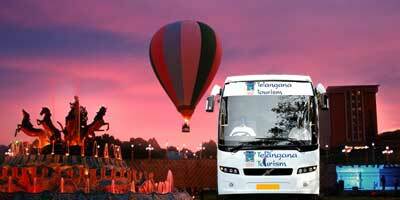 The tour also includes lighting at Golconda Fort and Chowmahalla Palace. You need not worry about Falaknuma Palace timings and entry fee as these are taken care in the tour itself. It is usually organised on Saturday and Sunday. If interested, travellers can also stay at the palace and explore its exotic and intricate beauty at leisure, while enjoying the lavish comfort of their stay. 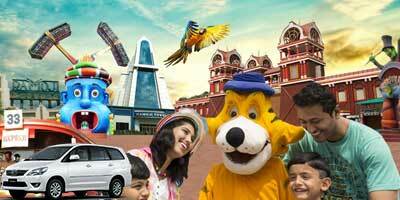 This Palace was taken over by Taj Group and has been opened as 5-star hotel in the year of 2010. 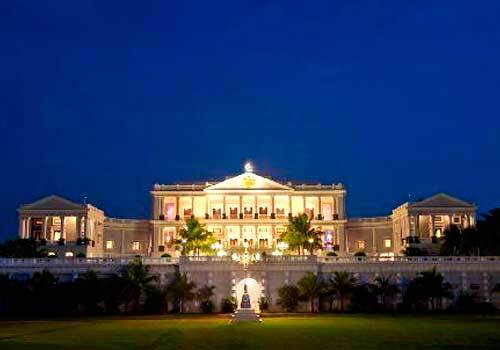 Now it is popularly known as the Taj Falaknuma Palace. The hotel is consisted of 60 spacious guestrooms offering all the visitors with a royal experience. The hotel not just offers grand staying opportunities but also has a tea room, hookah lounge and two restaurants for everyone. It is said that that Nizam was a great traveller and that's the reason why he had such rich collection of status, paintings, books and even furniture...all this you can actually see at Falaknuma. you can enjoy a royal living here..the interiors of rooms..its gardens..everything takes you back to nizam times..this is not a tourist spot now so as such no fixed entry fee or timings of Falaknuma palace but some tours are available which take you for a short trip inside palace..you can look up online for that..
Can say one thing for sure, it is one of the most stunning palaces of India. It is converted into a luxury hotel ...thats we could explore this place even better...we felt actually like a royal! everything is so grand about this palace..even chandeliers! There many paintings and statues..which are still kept intact...all throughout my stay I was mesmerised by the sheer beauty! for those who are not staying here, Falaknuma palace visiting hours are not fixed..only throughout the official tour you can visit it. I went to Falaknuma palace with my husband for dinner...it was our anniversary so we wanted to something different. Trust me it was our one of the best dinners till date! its not like a normal fine dining experience but so much more! as we were going for dinner we didn’t check timings and entry fee of Falaknuma palace..but ya do make reservations in advance...even at the entrance they will check that...food was not exceptional but i liked the service and the ambiance..we could also see the real beauty of the palace that added to the overall experience. We wanted to Falaknuma Palace, but as it is not open for public we took the tour package from Telangana tourism. 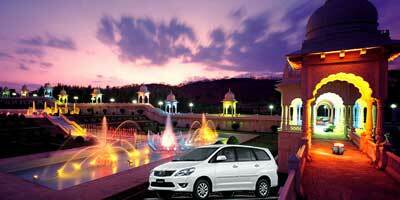 The tour included not only Falaknuma trip...we were taken to other places as well. We had an amazing time having tea and snacks at Falaknuma. As far as Falaknuma timings are concerned, I am not sure...we just followed the tour plan. 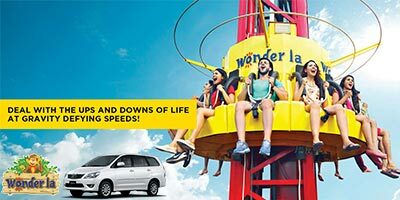 in any case the experience was memorable! The palace is just BEAUTIFUL...it felt quite royal to eat there! This palace is just too good for spending some days here...the beauty is so captivating, like an architectural masterpiece. I have seen many palaces and forts but Falaknuma surpasses many other. may be because it is well maintained..that's why still looks so fresh..but yet the only set back is its very expensive. so plan properly before coming here..may be once in year. If you are planning your visit here..forget about falaknuma palace entry fee or anything..but decide on a stay here..although expensive it's worth afterall. We went to Falaknuma on our last visit to Hyderabad...its expansive, grand and just too stunning! We were told that there are more than 200 huge rooms inside it and about 22 halls.. this palace is majestic! we actually wanted to just go to see..but while searching for timings for Falaknuma palace visiting hours and entry fee we got to know that it now a star hotel..so we decided to have two day of stay..stay here was just perfect..the service,..rooms..interiors ..we might just go there again! Falaknuma Palace is quite near to Charminar. so we planned our trip that way, we went through Telangana tourism tours...but later we hopped out separately and went to Charminar & laad bazaar. The day was well spent! As such with tour you need not pay additional Falaknuma palace entry fee as everything in included in the tour package. it was better as we didn’t have to do anything..they did every arrangement. But ya we wanted some more time at the palace which we couldn’t get! there is so much to see at Falaknuma palace!